2016 for me seems to be a good year for working towards making your dreams a reality. I know many people who are doing this, from writing a book to starting a healing business. My dream is to sell my artwork. I had previously been working on this, but had come to a dead end. Then one day I picked a tarot card (for no particular reason) and it told me to seek guidance from an expert to help with my creative endeavour and that the expense would be worth it. I thought I didn’t need help with my painting itself, but then I did realise I needed help promoting and marketing my work. So I sat down to meditate (just sitting cross-legged which helps keep your spine straight and the energy flowing). I asked Spirit who I needed to ask for help and the answer came back to me – Karen Downing! So I have been working with Karen for the past 2 months on putting my artwork out there, including branding and promoting. It has been very useful. The first thing she told me was my artwork needs to be on bigger canvases, which once she said it, made complete sense. She also suggested marketing towards a more affluent clientele, including aiming for a business market. I had always struggled explaining my artwork, but after an hour of sitting staring at the computer (thinking business market) and picking my hair (a bad habit I am weaning myself off) I started writing descriptions and I finally felt that I understood my artwork! And the more I channelled explanations, the easier it got. 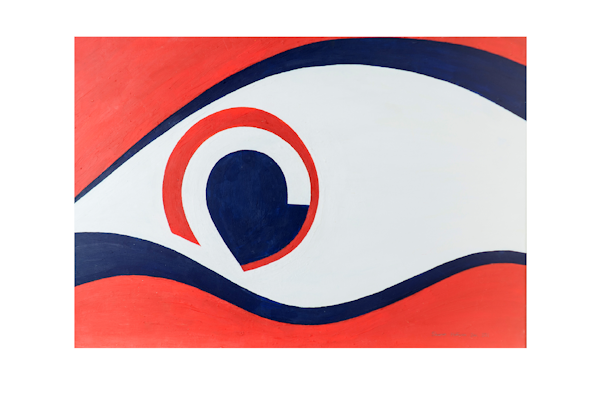 Recently I was able to understand one of my paintings that is very personal to me and is in my bedroom that looks like an eye. I realised that in the painting Spirit is telling me to see the beauty within. So now when I look at the painting I don’t just feel a connection, I hear Spirit telling me to see the beauty in myself (which being a critical Virgo I don’t always find the easiest thing to do!). Recently I was set homework to put my work on Pinterest and Instagram. As Karen was explaining what I needed to do, I could feel the energy in my solar plexus tightening more and more with fear! However, when I did put my work on these sites, I realised how easy it was to do, and wondered what the fuss had been about (fear always seems to go that way). As I have sessions, I can see the fear in me being chipped away at bit by bit. Also we have covered past lives, including one where I prostituted myself to sell my artwork and was then hung when I rebelled and made a sculpture the church disagreed with. I felt so sick hearing about this past life (I was releasing the past life energy and it lasted quite a while after the session too). And also, I realised I did have a subconscious belief I was going to be killed if I put my work out. So, I could see this was quite a barrier to promoting myself, lol. Throughout the sessions energy work is going on too, and I usually have symptoms afterwards, for example last time I suddenly got a cold after and also I have lost my voice. I don’t know what will happen at the end of the sessions, all I know is that I am chipping away at fear; I am moving in the right direction; and I am determined to the best I possibly can! I have to! I would recommend getting help making your dreams a reality, sometimes we need a bit of support!